It has taken me a few days to get my mindset shifted to be able to enjoy China, but I think I am coming around. Not only is it the change from Thailand to China, but the change from small town to big city, warm weather to chillier, and traveling with folks to traveling solo all happening at once. Those things considered, I'm doing pretty well. The big thing to see here in Xi'an is Emperor Qin's Terra Cotta Army. If you've never heard of it, any explanation I give will sound dumb, so I suggest you go learn about it. Sufficive to say, it was pretty cool. They've built a great museum around the whole thing and showed the whole process of excavating them. Yesterday, I went to see the Small Wild Goose Pagoda. It was built in 709 or something, way way back. Around the pagoda, there are beautiful grounds an other buildings in the traditional style. It was a great place to sit and soak up the traditional China-ness of everything. All my other efforts here are in regards to the small things. While they don't sound like much, the few small victories I've managed have raised my spirits much. Riding public transportation, ordering food by pointing and smiling, and purchasing a train ticket to Beijing using only gestures. But with my small victories have also come small defeats. Last night, somewhat down about the whole Chinese-Chinese-food-is-not-at-all-like-American-Chinese-food thing, I opted to indulge myself in the cultural experience that is pizza hut. Same same, but different. The whole time that I have been in Xi'an, it has been foggy(/smoggy?) and it rained pretty good yesterday, so I haven't been too inclined to go adventuring. But that has allowed me to catch up on a few movies here in the hostel and also catch up on my reading. Tonite, I leave on a sleeper train to Beijing, which I am greatly looking forward to. I hope to see some of the country side that is the China in my mind. Just as long as we get out of this fog(/smog? ), I think I'll be fine. Sounds like a blast. I've been reading a book (amazing surprise! ), and Nick Danziger arrived in China just about the same time you were arriving in China. One of his first stops, and apparently yours, was the terracotta army and then on to Beijing. Cool coincidence. So, head's up to my children, get busy, 'cause I want a wee tomb like that in which to be ensconced--with terracotta figures of all my relatives. eh? Oh, and did I say fresh flowers every day? Hop to it. i'd be impressed if you could escape the smog. did i mention that china sounds more fun than being unemployed in new york? Going into this trip, I didn't have much of a plan, but I did have a few goals. I'm pleased to say that a good number of those goals can now be checked off. Firstly, it was/is my goal to get at least one geocache in every country I visit. So far in Thailand, I've gotten two. The last one was in Phuket at a beautiful waterfall. Per saved the day by finding it after the rest of us had given up. Three cheers for Hanwool. Another goal has proved to be underambitious. The original goal was to read a book a week. I've been here for 2.5 weeks, and I've already read 4 books, all trash. And that is with having constant traveling partners. Once I set out on my own, I imagine I will bump the average up to 2 a week. Goal #3 is really one of my favorites: go 24 hours shirtless. I went a good 6 weeks while in Palmyra, but that wasn't real life. Well, after yesterday, I'm pleased to say Mission Accomplished. We are back on Ko Phi Phi after letting Andrew and the boys off at the Airport. Yesterday, Trista and I took a tour out to Ko Phi Phi Ley, the highlight of which was Maya Bay, made famous by The Beach. (I didn't take this picture, but I could have.) We also snorkeled, stopped at a beach inhabited by monkeys, and got the experience of riding in a "traditional" Thai long tail boat. (More about that later). Anyway, it was a great time. What'd you give/get in the geocaches? Wasn't there a goal about crosswords and Sudoko? This Blog might be too much information (TMI) for a mother! Wren, you lucky dog. I'm jealous and happy for you. 1: Mom, If hear about your boy going with a shirt for 24 hours (I'm up to 96 hours now) is TMI, then I will have to severely edit my stories when I get back. 2: Saxtor, I had to edit up your comment because the comments section has a few issues regarding HTML or something. I'll have a look at that when I get a chance. Week two of my grand aventure was a nice change of pace from week one. While week was one full immersion in the culture, and packing in monuments, treks, and elephant rides, week two has been much more chill. I've spent no less than 3 days on the beach, snorkeling, reading, swimming, and getting sunburned. Andrew, Per, Myke and I spent 3 nights on Ko Phi Phi. Then they headed off to Ko Lanta while I headed into Phukettown to pick up Shane and Trista. After meeting back up, we've spent the last 3 nights here in Phukettown at the best hostel I have ever been to (did I mention the free internet?). 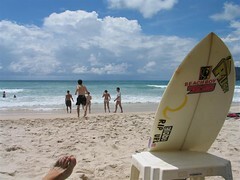 Yesterday we spent the day at Patong beach where Myke tried to shrelp the gnar, but was mildly thwarted. He will prolly try again today. The rest of us juggled, hackied, read, ate fresh fruit, bodysurfed, and got really sunburned (okay, so maybe just Trista and I got the burns). It has been great having the 6 of us together. Being with good friends in such a beautiful place is just the ticket. Meals are fun. Traveling is fun. Going to 7-11 is fun. It is all fun. But tomorrow, Per, Myke, and Andrew head off back to the states. After that, it sounds like Shane, Trista, and I will go back out to the islands, at least for a bit. But who knows. I'll keep you posted. that is some nice shrelping! who took that picture, that is up close! myke, I expect you on the olympic peninsula when you get back! It is very beautiful there and sounds like good times. i even found it on the world atlas. aren't you proud? i amd learning a lot from your travels. Whoa, I just got the coolness of this seemingly normal picture. Glad the traveling hasn't dulled your technological expertise! Now you know why we call Per "Twinkle Toes." hey, lovely picture dump! I can't wait to see it for myself! And this free internet is great! that looks like a strong wind a blowing in that bottom picture! did that blow your hammock around? Great photos, if you have anymore wavey ocean ones, this old salt wouldn't mind seeing them! I never saw wave pictures at Old Salts...I saw jo-jos, however. Nice batch of photos, but that first "secluded" beach doesn't look so secluded. Who's the boat owner?